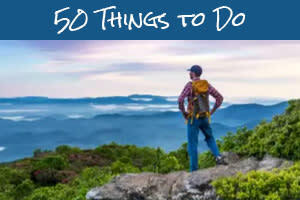 50 Things to Do in Asheville, N.C. 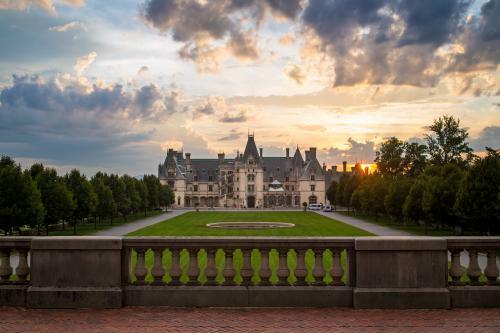 If you’re looking for things to do in Asheville, then consider this list your primer to the many activities available in the Blue Ridge Mountains. 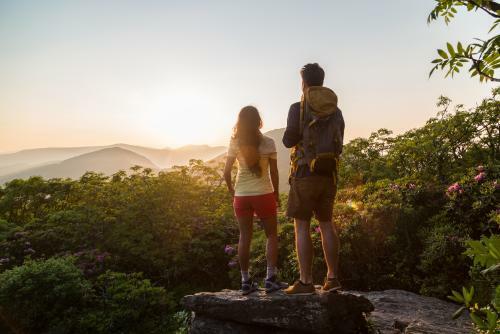 Whether you’re a first-time visitor, or perhaps well acquainted with the flair of this Southern Appalachia getaway, here are 50 ideas to help you see, do, and explore the best Asheville has to offer. 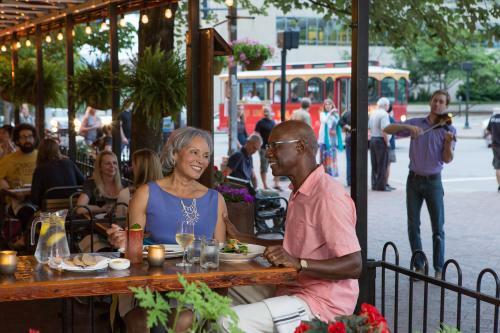 You feel it the moment you begin strolling through Asheville’s vibrant city center – it’s an unmistakable mountain vibe that has beckoned visitors to this region time and again. 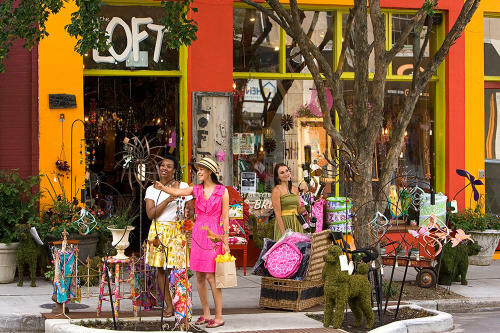 Lining the streets of this walkable neighborhood you&apos;ll find a wide array of independent shops, craft breweries, and some of the best dining options in the southeast. 2. 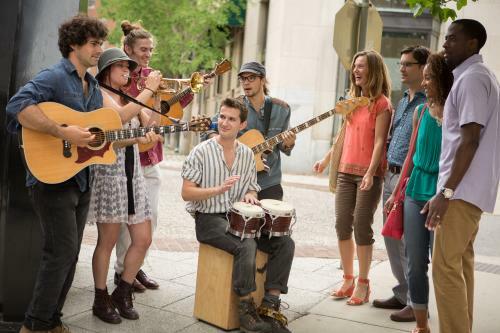 Take in Asheville&apos;s freshest talent with the many lively street performances from talented buskers. 4. Learn how this hip mountain town came to be. Jump aboard LaZoom, the big purple bus, for an irreverent look into Asheville’s colorful history, cruise through town on the hop-on-hop-off trolley tours guided by local storytellers, or learn more about the city’s unique past on a self-guided walking tour along the Urban Trail. 5. Peruse Asheville&apos;s legendary independent bookstores like Malaprops and Captain&apos;s Bookshelf, or sip champagne with your pooch at the Battery Park Book Exchange. 6. 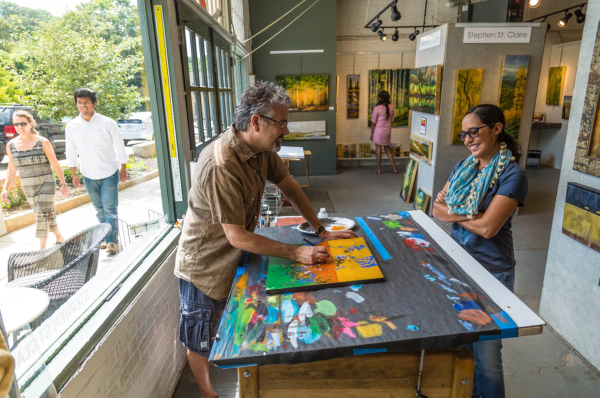 Find that perfect piece of art or handmade craft available for sale at downtown art galleries, craft fairs, or the open-air market at Grove Arcade. 7. Climb to the top of Asheville&apos;s tallest buildings and enjoy the view from above at one of the many rooftop hangouts like SkyBar and downtown&apos;s Thirsty Monk. 9. Explore Asheville&apos;s darker side with a nighttime Haunted Asheville tour, or immerse yourself in the theatrical solve-a-puzzle-to-escape challenge, Condundrum. 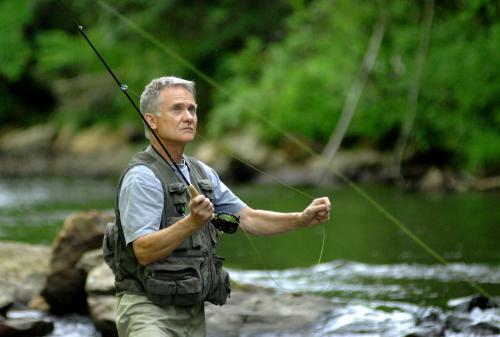 The breathtaking beauty of the Blue Ridge Mountains has lured travelers to this region for over a century, and no trip to Asheville would be complete without exploring some of America’s most cherished national forests, like Pisgah and Nantahala. 26. Explore the nature trails at the North Carolina Arboretum and the Botanical Gardens of Asheville, both of which are home to numerous indigenous species of mountain flora. 27. Go golfing at some of the most beautiful and challenging courses in the country. Asheville’s buzz-worthy food scene is packed with amazing places to eat. Our culinary mecca serves as a magnet for innovative chefs and food artisans, most of which source their ingredients from the hundreds of farms surrounding the city. With so many delectable options, the hardest decision you’ll have to make is where to dine. 29. Get a little taste of everything by signing up for a food tour. You’ll be able to sample cuisine from numerous restaurants in an afternoon. 30. Learn how to find your own food with a guided foraging expedition through the mountains. 31. Visit local farms to buy the freshest meats, veggies, and cheese available in the mountains. This is a perfect way to take a little Foodtopia back home. 32. Nosh on award winning cheeses by visiting the multiple creameries along the WNC Cheese Trail. 33. Stock up on fresh local ingredients by shopping at one of the multiple farmers markets around town, or simply stop in for a bite to eat from one of the many vendors. 34. 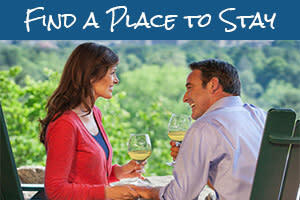 Sip the mountain’s finest nectar while touring one of the area&apos;s many wineries with French Broad Vignerons, or go for a free tasting at Biltmore, the most visited winery in America. Asheville has been home to some of the world’s greatest artists, writers, musicians, and architects. They left an enduring mark on this town and many of their legacies are still present as you walk through town. 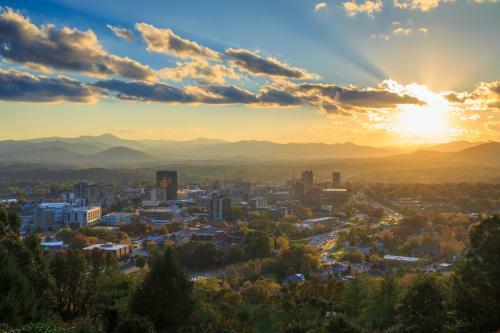 Get a closer look into Asheville&apos;s rich heritage, and tap into the bohemian spirit, which still influences Asheville today. 36. See amazing performances by Asheville&apos;s numerous theater troupes including the Diana Wortham Theatre, which hosts some of the best in local and national productions, NC Stage, the Asheville Community Theatre, Magnetic Theatre, and in the warmer months, take in a free outdoor Shakespeare production performed by the Montford Park Players. 37. 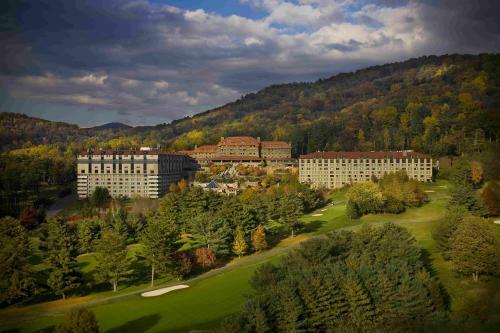 Take a guided history tour with Asheville by Foot to learn more about Asheville’s incredible array of Art Deco buildings including the Basilica of St. Lawrence, which boasts the largest free-standing dome in North America. 38. Visit the childhood home of literary legend Thomas Wolfe, which he immortalized in his autobiographical novel, Look Homeward Angel. Along the riverbank of the French Broad, spend an afternoon strolling through former industrial warehouses now filled with hundreds of working artist studios. Watch a live exhibit, peruse numerous galleries to find that perfectly handcrafted piece of art for your collection, or get hands on with one of the many immersive programs available. You&apos;ll also find this neighborhood is home to some of Asheville&apos;s most popular restaurants and a brewery, perfect for a pit stop in between galleries. 40. Asheville is home to some classic, and in some cases, quirky museums. Check out the fine art exhibits at the Asheville Art Museum, find vintage games at the Pinball Museum (yes, you can play! ), or for a real throwback Thursday, visit the antique car museum. 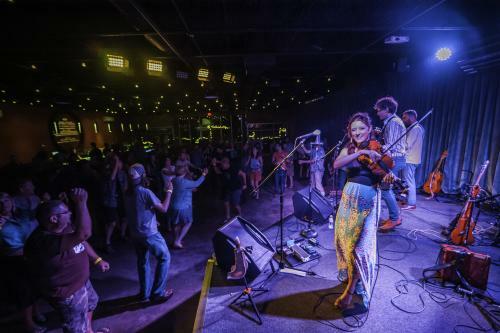 Hailed as one of America’s “Greatest Music Cities,” Asheville’s live music scene is beginning to garner national attention. Intimate music halls, unassuming neighborhood bars, and even the streets of downtown play host to some of the best in local and national touring musicians. You’ll find the sound is steeped in old time mountain music, but it’s the full spectrum of innovative musicians who truly define Asheville’s sound. 42. 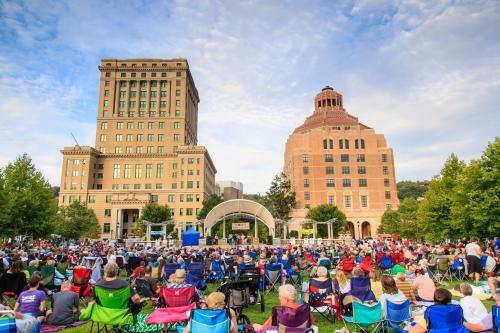 Immerse yourself in one of Asheville&apos;s many music festivals taking place throughout the year. Downtown After 5, the LEAF festival, and Brewgrass are among the most popular. 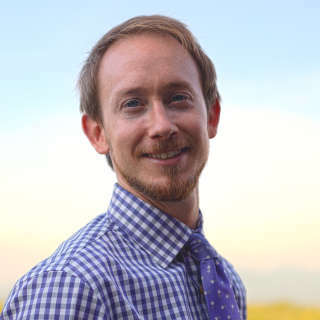 You can also tap your toe at a free Shindig on the Green concert, or make plans to attend the Mountain Dance and Folk Festival, the nation’s longest running festival of its kind. 43. Get up close and personal with your favorite artist at one of Asheville&apos;s many iconic music venues. The Orange Peel, a venue hailed as one of the best in the nation by Rolling Stone Magazine, Grey Eagle, and ISIS Music Hall are all great places to see live music. 44. Tour the Moog Music Factory. Bob Moog was a pioneer of electronic music and a resident of Asheville. He gave the world its first synthesizer, an innovation that is still hand-crafted in downtown Asheville to this day. Watch these incredible instruments being made and take one home for yourself. 45.Catch the classics as performed by the Asheville Symphony Orchestra and the Asheville Lyric Opera. Each season they perform a blend of timeless compositions along with more contemporary arrangements. Built for the ages, this iconic Inn has adorned Sunset Mountain for over a century, and offers an amazing view of the western mountains. Built with giant boulders collected from the surrounding mountainside, this glorious lodge has welcomed ten U.S. Presidents, it boasts the largest collections of arts and crafts furniture, and it&apos;s listed on the National Registry of Historic Places. Watch the sunset while dining al fresco, take in a round of golf on the Donald Ross-designed course, or unwind in their subterranean spa experience. #47 Let the stress of the day-to-day melt away in the hot tubs of Shoji spa, feel the healing properties of a salt cave, or get pampered at one of the many day spas located throughout town. Asheville is a special place for craft-brew enthusiasts. The secret ingredient is the mountain-filtered water, making for some of the most sought-after ales, stouts, and sour beers in the southeast. With more breweries per capita than any other city, you’ll have plenty of options to consider. #49. Explore the beer scene by foot or on wheels. Many breweries are within walking distance from each other around downtown, but the Brews Cruise will deliver you to the more remote breweries. Plus they can get you a behind-the-scenes peek at the operations. You can also pedal for beer on a people-fueled pub-cycle. 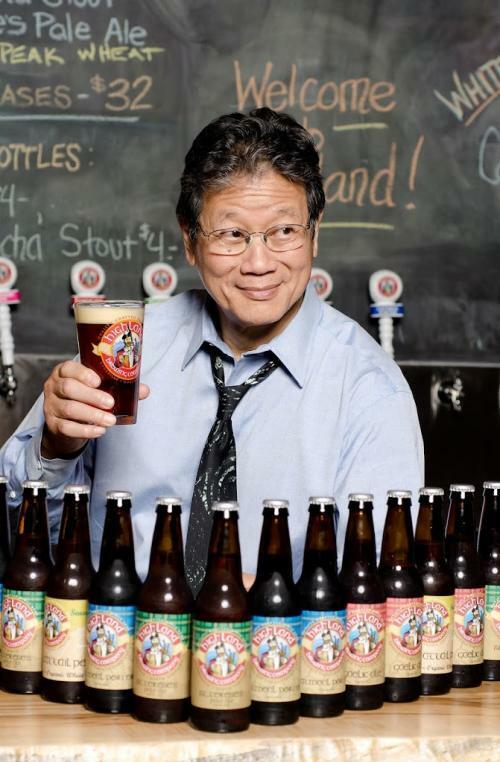 Before you head home stock up on local flavors at our specialty beers shops like Bruisin&apos; Ales or Tasty Beverage Company. #50 Want more ideas? Stop by the Asheville Visitor Center when you get to town, and the knowledgeable staff can provide further recommendations.